Pixar's "The Incredibles" is by far the best of the CGI-animated films in the Disney canon, a wondrous and exciting spectacle that is just as enticing narratively as it is visually, and a film that reaffirms the strength of the animator's imagination. It's also a considerably extreme departure from the Pixar standard, side-stepping the widely-accepted "buddy movie" approach of films like "Finding Nemo" and "Toy Story" so that it can charter new and more satirical territory - namely, a story involving a family of misfit superheroes. The leader of the pack, Mr. Incredible, is kind of like a Superman with more compatible social skills, and his partner in crime, the virtuous and fetching Elastigirl, is a headstrong woman who is perfectly capable of holding her own against a job dominated by the male ego. Together, they live by the tasks of any standard superhero formula - save the world, try to live a "normal" life, then save the world all over again - but as the movie opens, their vocation of choice is suddenly undermined by the onslaught of countless frivolous lawsuits (in one instance, Mr. Incredible saves a suicidal man but winds up injuring him in the process, thus resulting in a legal battle). With the profession now threatened, heroes worldwide turn in their masks and enroll in the Superhero Relocation Program. Their days of saving lives and correcting misdeeds, it seems, are over. And all of this transpires in a genre that has thus far been dominated by talking toys, bugs, fish, ogres and monsters since its inception in the mid 1990s. Now, at long last, the focus is brought to the human characters, who are just as (if not more) interesting in computer animation as any cute and fuzzy creature that a filmmaker can come up with. And yet contrary to the perception that the material is basically straightforward adventure, there is something a lot more mature about the approach. It thrives on pop culture references, and it obtains a certain sarcastic treatment that is more than just casual children's humor. In an era when the movie cartoon appears to be solely targeting the youngster, how nice it is to see an endeavor that is still interested in engaging the older folks, too. Also nice is how the plot takes a more social approach to the superhero ideals. Years have passed since their profession was squandered by the legal system, and now Mr. Incredible and Elastigirl, or Helen and Bob Parr, are living routine lives in the suburbs. 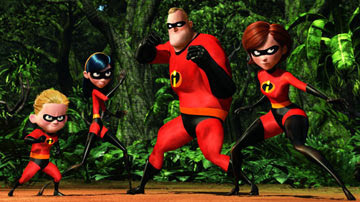 The have children now, too: Dash, a boy who, as his name implies, can make made dashes across terrain at virtually any speed; Violet, a teenage girl who can make herself disappear as well as channel energy into yielding force fields; and Jack Jack, an infant whose only super power thus far is being an ordinary baby. As a family suppressed into the constraints of ordinary human existence, they live day in and day out without the opportunity to be the people fate has intended them to be. That notion is particularly frustrating for Bob, who compensates by slipping company secrets under the table to clients at his insurance firm, and then listens to the police scanner at night with his good pal Lucius (aka superhero Frozone) looking for crimes he can assist quietly in. Helen, naturally, would be perfectly content in living a normal existence, and when she finds out that her husband is still playing superman behind her back, she worries that the family's safety will eventually crumble. As luck would have it, Bob's renewed interest in crime-fighting could not have come at a better time. On an island far off the coast, a spiteful villain known as Syndrome (a former Mr. 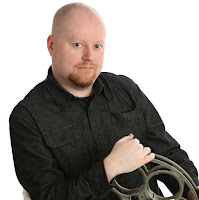 Incredible admirer who botched one of his missions in the early part of the film) has built a vast fortress in a volcano and is assembling high-tech weapons for a plan that, among other things, would lure ex-superheroes out of hiding and into a death trap. Bad news for him: his latest trap, set for Mr. Incredible himself, backfires at the last minute, and as a result the rest of the Parr family sets out to rescue Bob as well as save the world from the tyranny of a disgruntled fanatic. This is not so much a plot description, however, as it is an examination of the devices that make the movie tick. The common flaw involving any film about superheroes is clichés - not just standard "save the world, get the girl"-type ones, but also those that insist people who live with super powers always have to be social outsiders (Clark Kent, Peter Parker, etc.). Take away the tights and the capes and those nifty black masks, however, and the Parrs seem like your standard suburban family. They don't consciously dwell on their super strengths, but try to live life around them, as if they are just mere speed bumps instead of road blocks. That may or may not be an approach that interests the film's younger audience, but it does offer a certain social dimension for the mature viewers, who are probably just as interested in overall context as they are in playful action and adventure sequences. Above all else, however, "The Incredibles" is populated by some of the richest characterizations we have seen in feature animation in years. Consider, for example, Frozone (voiced by Samuel L. Jackson), another former superhero who, as his name implies, made things freeze. The movie is less interested in his skills and more in his personality, and the script provides him with amusing one-liners from beginning to end. Also consider Elastigirl, who, also as her name implies, can contort her body into any shape and stretch long distances if she needs to (the movie makes humorous use of this gimmick later on when she accidentally gets stuck in between two doorways). She's a mother, a care-giver and a crime-fighter, but when push comes to shove, she knows when it's time to stop being nice and start playing dirty. Bond fanatics will instantly identify with the notion of the villain's need to seclude operations on his own island (wasn't that a plot device born in the 007 franchise? ), and they will also be amused by the inclusion of an M-like contributor named Edna, who considers herself the primary fashion designer for the superhero sector (interesting side note: Edna is actually modeled after Oscar-winning costume designer Edith Head, who offered her expertise to many of the important films in Hollywood's golden era). Writer and director Brad Bird, whose idea for this film was rejected by several other studios before being acquired by Pixar, has seemingly breathed new life into this genre here; his movie erases all traces of the conventional and rethinks the essence of computer animation. Kids, as to be expected, will probably not be as enticed by misfit superheroes as they were by talking fish or toys, but for those of us who embraced the adult undertones of films like "Shrek," the change is warmly welcome. Pixar has always been at the top of their game technologically, but now, at long last, they have joined the race for transcending multiple age groups. "The Incredibles" is entertaining on countless different levels, and as such emerges as one of the best films of the year.